Thanks to you our festival was a success again this year! Thanks so much to everyone who donated, attended the fest, volunteered, and of course, to our sponsors! We are truly grateful to have the support of our local community. We hope to see everyone again next year for our 16th Annual Autism Awareness Festival! Our Annual Autism Awareness Festival is an opportunity to meet new friends, network, learn about all the resources available in the greater New Orleans area, and have a fun-filled family day! 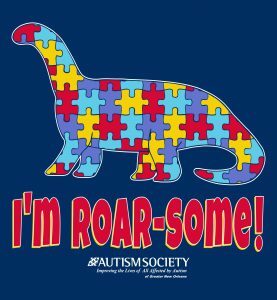 But most of all, it is a time to celebrate the individuality and many gifts and contributions our friends and family with autism bring to our community. So come on out and celebrate with us and join in supporting and improving the lives of all who are affected by autism. Food, Drinks, Music, and more!!! With your participation as well as your generous donations, we are able to continue to provide information and referral services through our Autism Help Line, eNewsletters, website, and social media; community and parent training events such as our Brushes, Buddies, and Beyond for Autism, Family Game Night, as well as our Mini Grant Program that provides grants to families and teachers for purchasing materials and equipment that help students with autism in their classrooms and children and adults with autism in their community. And because we are primarily an all-volunteer organization, nearly 100% of the money raised through your participation and generous donations will go towards providing these services to families living in the Greater New Orleans area and continuing our mission of improving the lives of all affected by autism. Each year, 1 in 59 children are diagnosed with Autism. 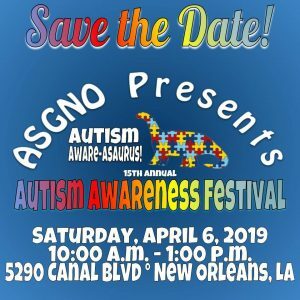 So our annual Festival not only helps raise awareness about and acceptance of autism, but it is our main fundraiser to support all who are living with autism in the Greater New Orleans area as part of our mission of improving the lives of all affected by autism. So all funds raised by the Autism Society of Greater New Orleans are spent in the Greater New Orleans area. For instance, each year we offer our mini-grant program to families and teachers to purchase materials and resources they need to support their child or student with Autism. We also started an Art Club in Chalmette and Metairie and a Family Game Night in Slidell and New Orleans. Additionally, we provide information and referral to over 1,300 families and professionals who contact us for support, subscribe to our Email list, use our local resource directory, and visit our Facebook page and website. Dufrene Surveying and Engineering Inc.
Dr. Terry Johnson, Ph. D.